The second candle is lit on this second Sunday in Advent. The second candle often represents the themes of Peace, Preparation, Patience or Acceptance. As Elizabeth and Zechariah came to accept that they would have a son whose name would be called John and who would prepare the way of the coming Lord; and as Mary accepted that she was the handmaid of God and would bear his Holy son Jesus - God come to earth in person, so we too come to accept the gift of God's only Son who came to save us from our sins and lead us to life eternal with God. When you think of the Christmas story, how does the story go in your mind? A couple of years ago, I went back to the Christmas story as found in Matthew and Luke. I read with a fresh eye, trying to read them as if I'd never read them before. I tried to keep the mythology and tradition that has grown up around the stories at bay, to read it without the hype and folklore that has been added over the years. Though familiar with the story and the scriptures from my youth, I was shocked to find that many of the things I took for granted about the story of the birth of Jesus were never mentioned, that they were things that have been added or surmised by humankind over the years since. There is nothing in the scriptures of Mary riding a donkey from Nazareth to Bethlehem. There is nothing said of a frantic search for a place to stay. There is nothing about a stable full of animals. There is nothing said of the shepherds seeing the star over Bethlehem or of angels singing, or even of the wise men coming to see the newborn Jesus where he was laid in the manger (though they did come to see him when he was somewhat older and the family was living in a house in Bethlehem). Yet in our minds, these things are all part of the Christmas story. “Behold, the virgin shall conceive and bear a son, and they shall call his name Immanuel” [Isaiah 7:14] (which means, God with us). In those days a decree went out from Caesar Augustus that all the world should be registered. This was the first registration when Quirinius was governor of Syria. And all went to be registered, each to his own town. And Joseph also went up from Galilee, from the town of Nazareth, to Judea, to the city of David, which is called Bethlehem, because he was of the house and lineage of David, to be registered with Mary, his betrothed, who was with child. And while they were there, the time came for her to give birth. And she gave birth to her first born son and wrapped him in swaddling cloths and laid him in a manger, because there was no place for them in the inn. When the angels went away from them into heaven, the shepherds said to one another, “Let us go over to Bethlehem and see this thing that has happened, which the Lord has made known to us.” And they went with haste and found Mary and Joseph, and the baby lying in a manger. And when they saw it, they made known the saying that been told them concerning this child. And all who heard it wondered at what the shepherds told them. But Mary treasured up all these things, pondering them in her heart. And the shepherds returned, glorifying and praising God for all they had heard and seen, as it had been told them. What we learn of Jesus from these two short passages of scripture is profound. - Jesus is God with us. - Jesus was born a savior, he is Christ the Lord. - This is news of great joy! - The birth of Jesus is a gift for all people. News of Great Joy indeed! 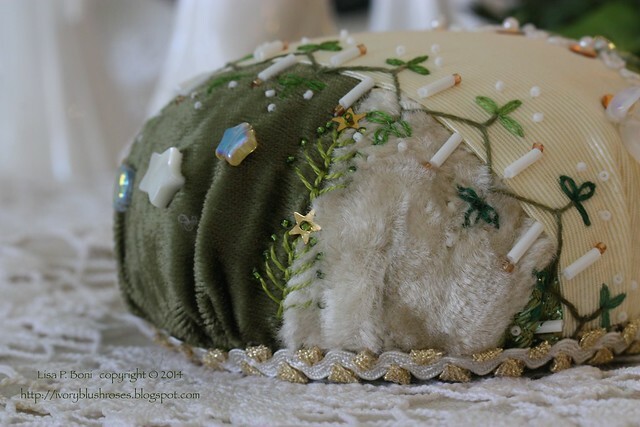 When I was creating this week's pincushion, I was struck with the thought of the angels sharing this news of great joy and with how the glory of the Lord surrounded the shepherds. One of the seams is somewhat reminiscent of angels and I added a small beaded angel and several stars. It was a lot of fun to go through the Christmas decorations and find angels from both my and my mother's collections to use in the photos! To enter a drawing for this week's pincushion, please leave a comment on this post! I have enabled commenting as an anonymous user, but please be sure to leave your name in the comment box so I know who the comment is from! Please note that comment moderation is turned on for all posts older than 10 days, so if you leave a comment on an older post, you will not see it until I have approved it. That can take a few days with my work schedule! 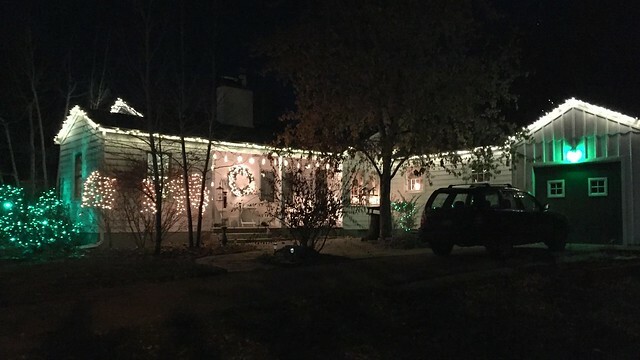 This past week, my son Stephen helped me put lights up around the house! I love the way they look! So nice to have sons who are capable of climbing up and down ladders as I am not at all comfortable on them! Today my daughter is here making jelly and baking cookies! A joy to have her here! 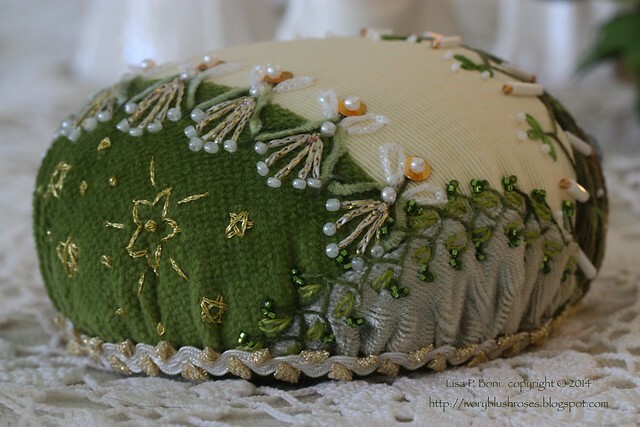 Another beautiful and inspiring blog post and pretty pin cushion. Another lovely post Lisa. The house looks beautiful with the lights up now. Sounds as if you've had a great couple of days enjoying time with family. 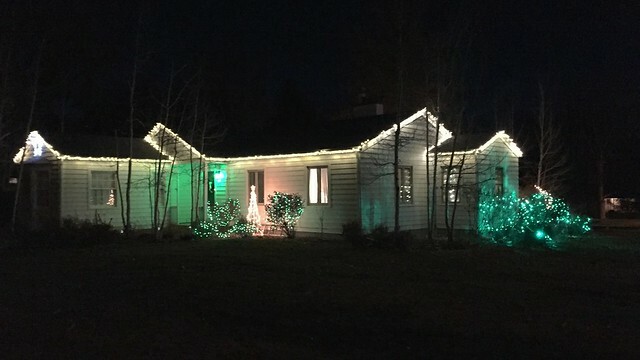 Your cozy little house looks beautiful all lit up for Christmas! I so enjoy your blog and watching your progress on CQ projects; I visit often but don't always comment. 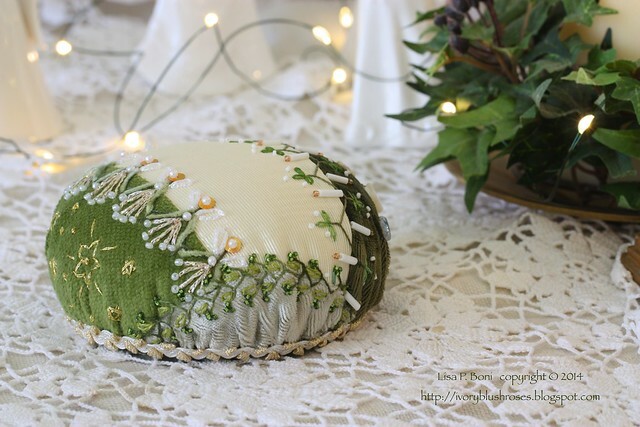 Please count me in for the pincushion giveaway- I don't know how I missed seeing the first one! I absolutely LOVE the pincushions you have made this year- my favorites are March, April and May. Each one is unique and special! Thanks for sharing your beautiful work with us!! Lisa, this pin cushion is fabulous! 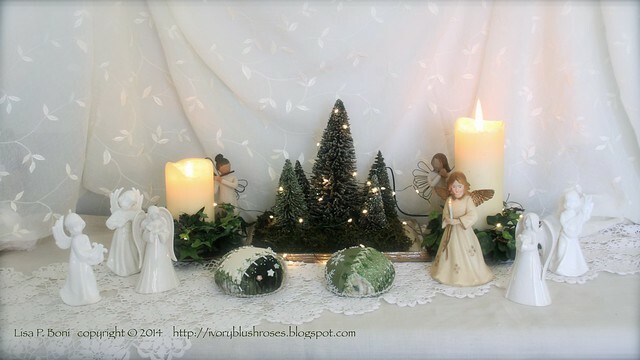 I just love the angel seams, the candles, stars and Christmas trees. Another stunningly beautiful treasure. Your home looks warm and cozy with the lovely lights and thoughts of being with family and your daughter making jelly inside complete the scene. I love your inspiring posts! Keep them coming (along with photos of your lovely work)! This was yet another lovely and inspirational post. God incarnate in Jesus. Your pincushions are really wonderful, your work exquisite. Your house looks sweet all lit up for Christmas. 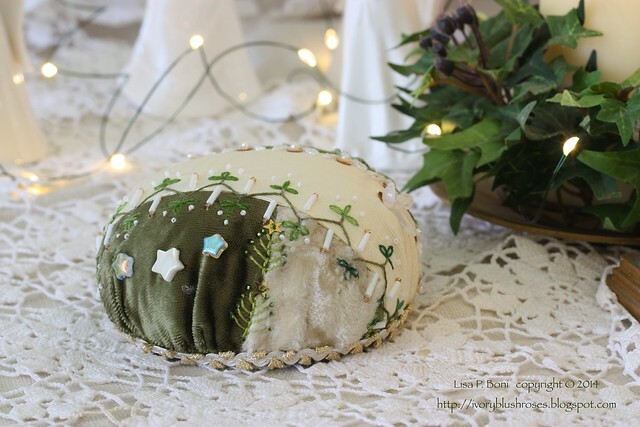 Lisa, I'm thrilled and grateful to win your beautiful pincushion! I admire your work so much and to have a piece for my own is an amazing prospect! Thank you from the bottom of my heart! Oh Lisa!! I would love to win one of your pincushions for my very own. I visit your blog often just hoping for a new post. I find your work very inspiring! Thanks for sharing the story. I know that each time a story is told, it is often changed and that when authors write a book they often embellish, so it doesn't surprise me. It is so important to remember the original. 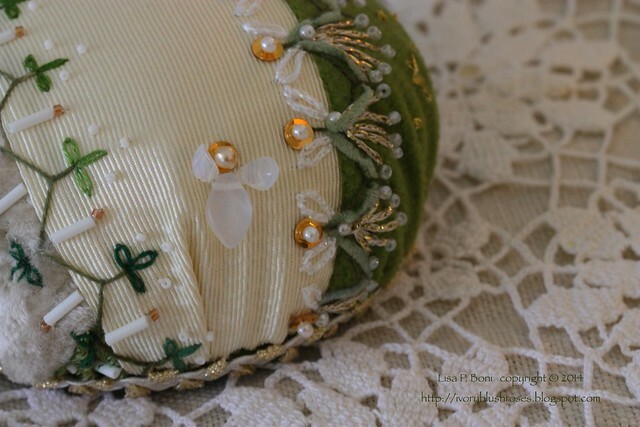 You make the most beautiful pin cushions and I would absolutely love to win one! Lisa! я всегда любуюсь вашими работами. Счастливого Рождества. Giarda. Lisa! я всегда любуюсь вашими работами. Wonderful you won the beautiful pinchusion. I'm sure you will treasure. So sweet Lisa made this to give away. You are indeed an artist. Beautiful work . Lisa I love your blog and your stitching. I was so happy when you went back to doing CQ. I would love to win one of your pin cushions and this one in particular since I am an angel collector and I love the angels on this cushion. Wishing you a very Merry Christmas! and all the small towns go all out with lights. Each pincushion you make becomes my new favorite. Your work is so soft and peaceful. 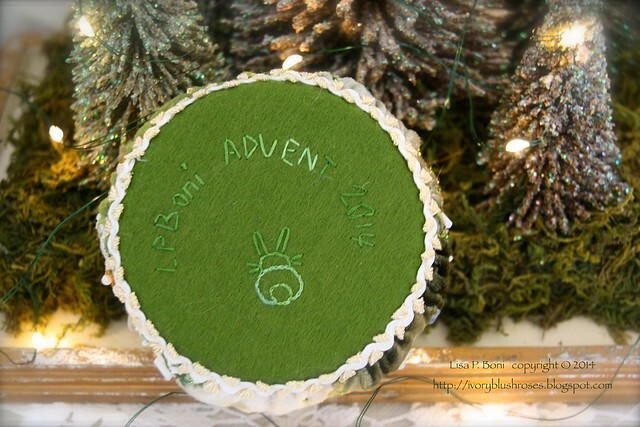 Thank you for your Advent meditations. Your beautiful pincushions speak as lovingly as your words. I look forward to week 3. What an inspiring post Lisa. I read it and thought, stories passed down often grow with time. The important part is celebrate the life of Jesus, and to live ours in a manner that would make Him proud. Your new pincushion is so beautiful. I especially love the beads that look like candles, and the tiny angel. So happy that you have your daughter with you. Enjoy each other. Your house looks wonderful. Love the color scheme and soft lights. Your blog with photos of your exquisite work is wonderful!!! I was looking to see if you have tutorials for those lovelies . What beauties!!! I love to see you embroidery work. Your crazy quilting is wonderful. Thanks for sharing.